It’s an honor and joy to share with you that my friend and bestselling author Ken Page will be hosting a free tele-seminar on Wednesday, March 25th at 5:30pm/PT, 8:30pm/ET. 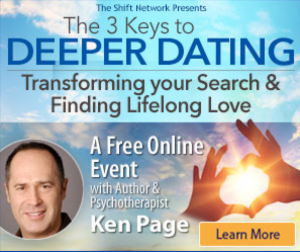 If you don’t yet know Ken, he’s a renowned psychotherapist, nationally syndicated columnist and the bestselling author of Deeper Dating: How to Drop The Games of Seduction and Discover the Power of Intimacy, of which I contributed to the section on online dating in his book. expressing your innate gifts — and his groundbreaking concepts and techniques are all backed by solid research. This is life-changing work. I have been personally very moved by the authenticity and wisdom of Ken’s teachings. I hope to “see” you there! It’s FREE to attend and you’ll receive a recording if you can’t listen live as well. Sign up here and claim your free seat. I just did! 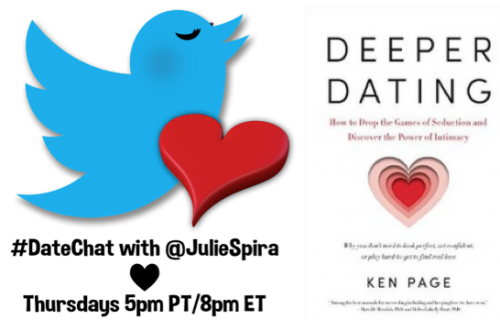 Join us for #DateChat on Thursday, February 19th at 5p/PT, 8p/ET with guest host Ken Page, author of the new book, Deeper Dating. Ken will be discussing his new theories of finding love and successful dating that ditch the old school thought of looking prettier and playing hard to get. It was an honor and joy to contribute to the online dating section of Ken’s new book. He’ll also be giving away 2 FREE copies of his bestselling book to some lucky #DateChat participants. If you’re Valentine’s Day was so-so or you were dateless, you won’t want to miss this week’s #DateChat. 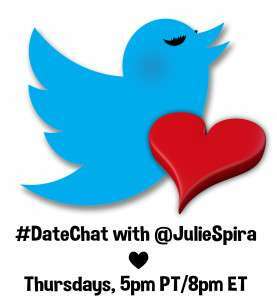 Remember to follow @JulieSpira and @KenPageLCSW on Twitter!